Here is another 1860s medicine from Wm. H. Keith in San Francisco. The two main versions of the Keith bottles are a citrate of magnesia type, and this oval medicine shape which comes in at least two sizes. These are usually aqua, and occasionally a greyish tone with an amethyst tint. This example is the most "purple" I have seen. For many years I suspected these were cod liver oil primarily as there are several eastern cod liver oils in this same shape embossed as such. 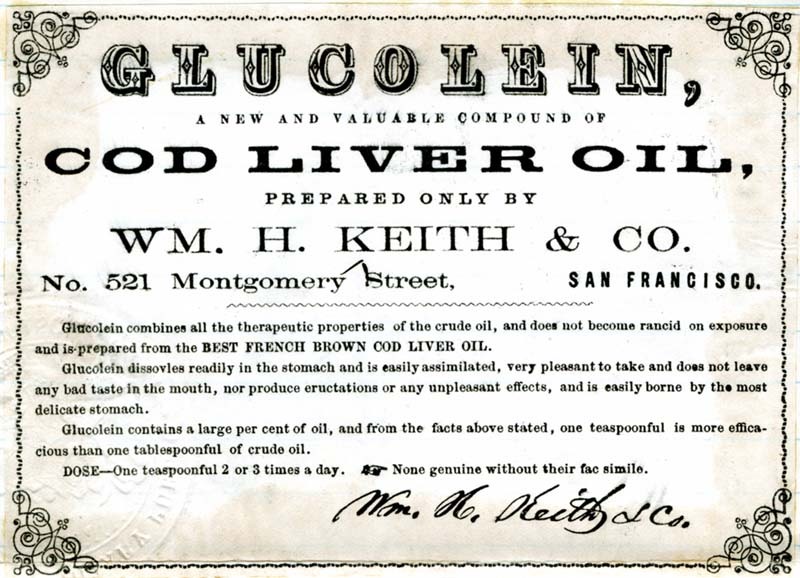 While I am sure these were a "generic" bottle for Keith in the 1860s, the advertisement clearly shows Keith's "Glucolein" cod liver oil. I believe these bottles were eastern blown, but are still crude and early examples of western qwack medicine at it's best! Perhaps the most common Keith bottle relatively are the Eastern-blown clear glass cylinders that come in a few sizes. From the Keith bottles I've personally seen the "Cod Liver Oil" style is the rarest. Although in the past year or so, three of these have sold on ebay. I've dug several of the 'cod liver' type, but not even seen a piece of a western one !!! Is it true that the western variant even comes in aqua ? have a round church candle looking aqua keith bottle with rolled lip, ponitel. embossed "glucolein". Have not seen an other. What do you know about this. 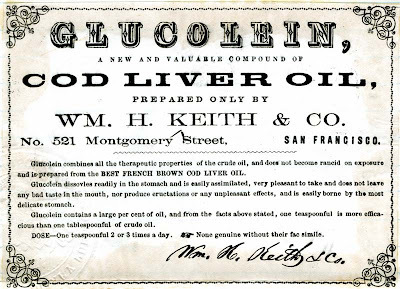 More information on the embossed glucolein. the lettering is vertical as such: glucolein/ Wm. H. Keith/ S. F.
The letters are very typical of early sf glass houses. Its a heavy whittled light aqua. Looks like a pringles chip can only a little shorter. So this is to say, that my bottle was the glucolein of your pictured add. Must have been a very tar like substance to require a wide mouth. The other oval bottles are for generic use. My bottle was at the very bottom of an all pointeled 25 foot well. I'd like to see a picture posted of the Glucolein here on the blog. when we dug the glucolein it looked like a broken auqa bottle,but had a applied or rolled lip like a pontiled pickle on a drinking glass shaped bottle ,not collecting the meds anonymous got the bottle and i collected whiskeys and got a millers fifth,rare but not as rare as the glucolein. I also heard of a Glucolein that came out of the Bay Area a few years ago. Photos anyone ? It has been awhile, but the "wide mouth" Glucolein that I have seen reminded me more of a dose glass, or drinking glass rather than a container which held cod liver oil. It may have been the delivery system as cod liver oil which is to be consumed (yummy), is not thick or a paste...who knows, as none of us were around back then and everything is conjecture. Even Pitcher's Castoria was distributed so heavily that I believe cod liver oil, or castor oil was used by everyone for various ailments common at the time. The wide mouth Keith is so rare that perhaps it was a delivery method rather than the container. Just my thoughts. I dug one of the pontiled Glucolein's in the SF Bay Area a number of yrs ago from a 1880s hole. Must've been a late throw.. Appeared to be Eastern made to me and a very early bottle, but who knows, maybe it is just simply a drinking glass to swig the tasty product from ! The ad posted in this blog, is the first of anything I've seen regarding this product. Sorry, I dont have a pic, since I sold the bottle shortly after digging it. Sure would like to get it back someday !! The keith bottle that I have is very much from one the S.F. glass houses. It does not look eastern in the least. The beautiful brilliant aqua glass along with the unique type S.F. type letters makes it west coast. I feel it is the actual Glucolein container. I did a test and the container is not prone for drinking out of. The Liquid all runs down your face. The huge rolled lip is not on any drinking glass I have even seen.----- Just my theory.